These were taken during our family trip in Singapore last June 2006. This is the first time we all went to an international trip. It also served as a celebration because 2006 was the year when me and 2 of my brothers finally graduated from college. Unfortunately not a lot of pictures were taken during the trip. On our first night, we ate dinner at this place beside Hotel Grand Central in Orchard Road. I forgot the name of the place, but this is where I tasted the best Chilli Crab ever! This picture was taken in Mount Faber station of Singapore Cable Car where we road the cable car going to Sentosa Island. I had a weird encounter with a Singaporean on this station who noticed the the loud statement in my shirt - "geek.". He was so delighted to see the shirt and got more excited when he was told it was a shirt that I got from Microsoft. 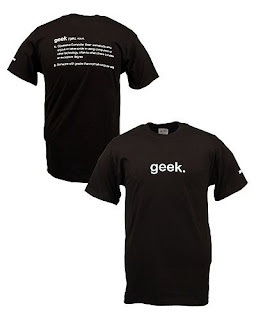 At the back, it reads "Geek (?gek), noun. 1. Obsessive Computer User: somebody who enjoys or takes pride in using computers or other technology, often to what others consider an excessive degree 2. Someone with greater than normal computer skills." He was so excited with his "discovery" that he asked me if he can copy the definition, to which I reluctantly agreed. After the encounter, we road a cable car going to Sentosa Island. It was, again, my first time to ride a cable car. In Sentosa, we watched the Magical Sentosa Fountain show, went to the aquarium (Underwater World), went up the Carlsberg Sky Tower, watched a few shows and so much more. On Sunday, we went to Church of the Sacred Heart to hear mass in Tank Road. We always pass by this "LOVE" monument in front of Park Mall near Dhoby Gaut MRT station. On the day before we went back to the Philippines. We met up with my mom's colleagues who brought us to Boat Quay. The place is full of restaurants of all sorts, where you can dine riverside. It is also one of the "place to be" at night. Right from where we're eating, we can see Asian Civilisations Museum. After eating, we went straight to Singapore Zoo. Too bad though it is closing in a couple of hours so we instead went to the Night Safari (right beside the Zoo). Other places we've went to Singapore includes Sim Lim Square for "geek toys" shopping, Chinatown, Orchard Road (only to window shop) among others. Singapore is an exciting city to visit - lot's of things to do, to experience, to eat, everything! I have an interesting experience getting lost in Singapore together with my brother. We went walking from our hotel trying to find our way to Sim Lim Square. We saw that it was just way up north from where we are but we realized we left the map in our room when we were already walking and didn't bother going back. In short, we got lost, walked from Orchard Road, to Cavenagh Road all the way to Bukit Timah. Good thing I have the number of Comfort Cab saved in my mobile phone (in roaming) because I was so amazed with the fact that you can "Dial-A-Cab", get confirmation code and wait for the cab. Until this day, I am so thankful for that service! I saw that LOVE monuement somewhere in downtown, Vancouver. i've heard there are actually quite a number of these all over the world. not sure if there's an organization who does all these or if it has deeper meaning. I thought this "LOVE" is erected by TGIF, an international chain restaurant?